Nothing like filling your home in the winter months with a beautiful seasonal scented candle. The scent is wonderful and the glow of the candle is so homely, it really is a win win. We love this fabulous offering from Sophie Allport and we think it will be a very welcome addition to your home this winter time. These luxury hand-poured candles are made in England and have been specially developed to create the optimum burn time and the best fragrance release. They are made using high quality mineral wax to achieve a long, clean and even burn. Made from 100% refined mineral wax blended with a high quality fragrance, this hand made candle will burn for up to 40 hours while gently perfuming your room. 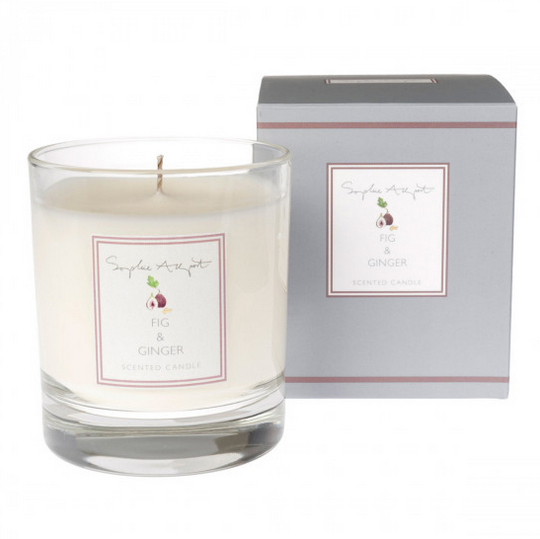 The inviting Fig & Ginger aroma of this beautiful candle is a warm soft fragrance. The neutral white candle is beautifully displayed in a clear glass tumbler in a high quality gift box. Whatever the occasion – Christmas, birthdays, anniversaries, mother’s day – they make the perfect personal gift, or just a little bit of luxury just for you.